Daila Kronberga’s farm “Dārzi” offers certified sea buckthorn plants with plant passes, registered with the SPPS, with certificate attached. • One-year and two-year Botaņičeskaja Ļubiteļskaja plant variety. Sea buckthorn bushes of this variety reach heights of 3.5 to 4 metres. Resistant to sea buckthorn wilting. Fruit - large, orange-yellow berries in cylindrical form which ripen in August. The variety is highly productive: up to 20-30 kg of fruit can be picked from a bush. • Local selection Lord pollinator-variety (male), with outstanding resistance to disease, high (85%) pollen germination and suitability for our climate. Bushes can be recognised by their narrow pruning angles and column-shaped crowns. 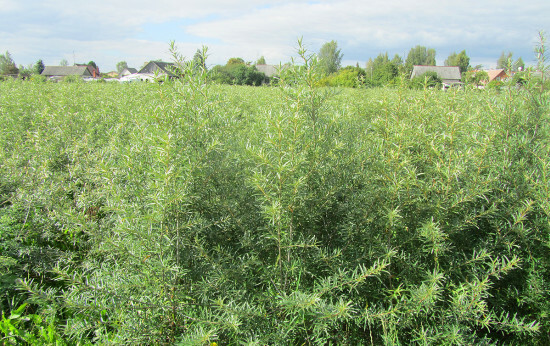 Mature sea buckthorn bushes of this variety can reach a height of 3.5 to 4 metres. If you want to install a commercial garden, we offer plants and consultations. We will consult you on planting sea buckthorn and the specifics of growing it. We offer you mutually beneficial long-term collaboration in selling berries.